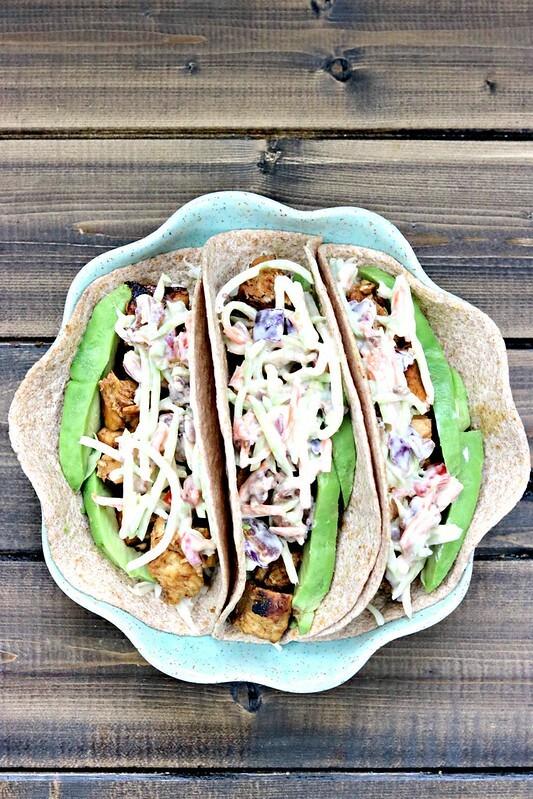 Honey chipotle chicken tacos topped with creamy honey mustard BLT slaw pack a flavorful punch in every bite! So first, let me start off by saying that I know how ridiculously long the title is. But, I assure you, it is necessary. Because all of the components are key to the dish!! Also, did you know that today is National Taco Day?? Hence why we are having a taco post on Wednesday and not Tuesday. I think it’s only fair that tacos have their own national holiday, because delicious. Especially these. I mean, honey chipotle marinated chicken, grilled and then topped not only with the delicious honey mustard slaw, but honey mustard blt slaw. Because, bacon. I mean, this honey mustard slaw is amazing on tacos and sliders on it’s own, but add some crispy bacon and tomatoes to it and…holy cow! It’s flavor and texture heaven! I could probably just sit and eat a bowl of it by itself. But then these tacos wouldn’t be quite as good. 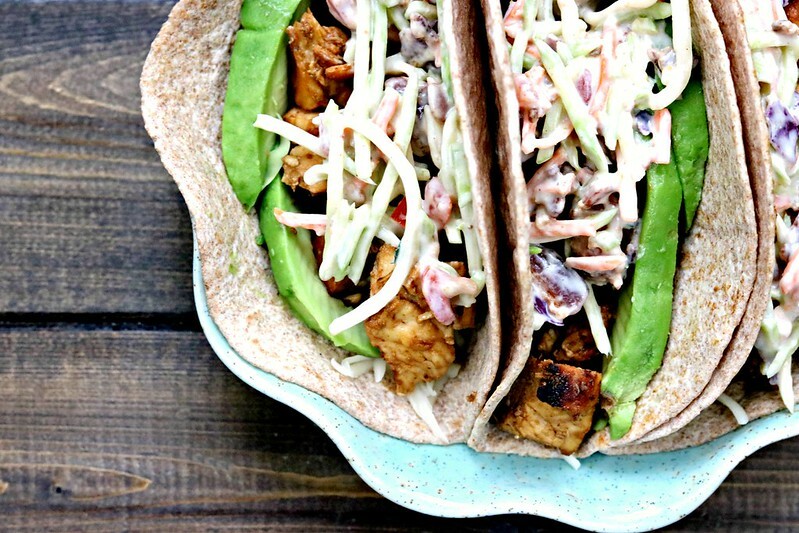 The honey chipotle chicken is tender and juicy and full of flavor as well, but that slaw just elevates it to a whole ‘nutha level. 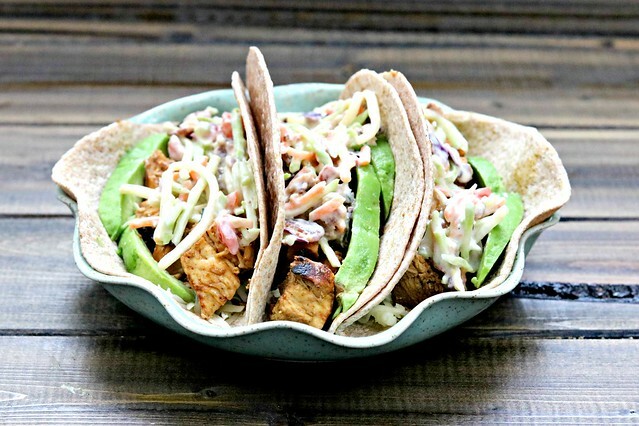 And since it is National Taco Day, these tacos are worthy of celebrating!! Whisk together all of the Honey Chipotle Marinade ingredients in a shallow dish, remove 3 tablespoons to a small bowl and set aside. Add chicken to marinade, turn to coat, cover and refrigerate for at least 30 minutes, up to 6 hours. Cook the bacon pieces in a skillet over medium heat until browned and crisp, then remove to a paper towel lined plate to drain grease. Heat a large non-stick skillet over medium high heat. Add the marinated chicken and cook for 3-5 minutes per side, or until nicely browned and cooked through. Remove chicken to a cutting board and allow to rest 5 minutes before cutting into cubes or strips. Toss with the reserved marinade. Meanwhile, in a large bowl, mix the Dijon, mayo, honey, salt and pepper, and milk. Stir the slaw in until thoroughly coated. If you use a traditional coleslaw type of mix, I would wait until you are closer to ready to serve to mix so it doesn't get soggy. The broccoli slaw holds up better, which is one reason I like it better. Stir in the tomatoes and the cooked bacon and set aside. * You can also use regular chipotles in adobo - just dice one chipotle with 1 teaspoon of adobo sauce.